Are there import fess for International/ Canadian orders? We cannot guarantee that you will or will not be charged customs/import taxes and fees. These fees are charged once the parcel reaches the destination country and need to be paid by the recipient of the parcel. This only applies to International and Canadian orders. This does not include swatch samples. You will receive email notifications when your order is placed, processed, and when it ships. If you have registered for an account on RediShade.com, you can also check the status there. Shipping is calculated automatically during the checkout process. Standard shipping is $6.95. Two day and next day shipping options are available before submitting the order. Orders usually start processing on the next business day. Orders take 1-2 business days to process. After processing, your order will take 3 to 7 business days to arrive with standard shipping. If you need it sooner, expedited shipping options, such as two day and next day shipping, are available before the completion of the transaction. Can I cancel or make changes to my order after it is placed? Production usually starts the first business day after we receive your order. Contact us within 24 hours from the time the order was placed, if you need to cancel or make changes. We can be reached by phone, (888)-608-6611 or email, customersupport@redishade.com. Please have your order number ready for quick reference. What if I receive my order damaged or incorrect? We hope that is never the case. Please contact our customer care team right away at (888) 608-6611, or by email, customersupport@redishade.com. Be sure to include your order number, and a brief description of the issue you are experiencing, pictures are always welcome. We will move quickly to help you resolve the issue as soon as possible. 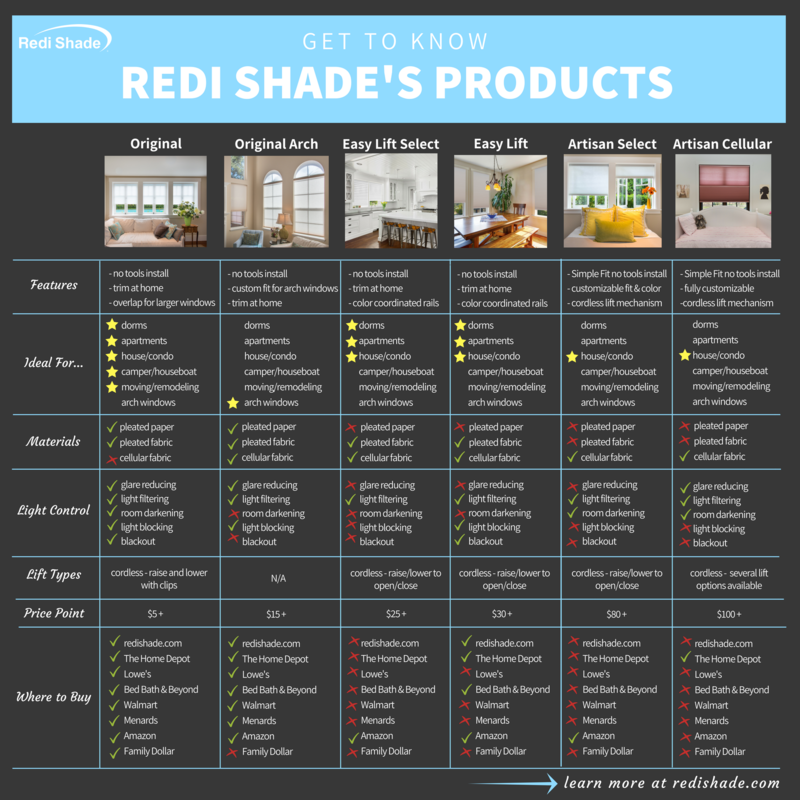 Where can I find Redi Shade Products? Head to the Product Locator to find Redi Shade Products in retail stores and online. What is the difference between the different product lines? We’ve created a handy side-by-side comparison chart featuring Original, Original Arch, Easy Lift Select, Easy Lift, Artisan Select, and Artisan Cellular. Check it out to learn more about the different product features, materials, light controls, lift types, price points, what rooms they’re ideal for, and where to buy them. Which shades use Simple Fit Installation and which use Simple Stick Installation? Where / What type of surface to mount the shades onto? The shades should be mounted onto a clean, dry, flat, smooth surface. We recommend using some rubbing alcohol to wipe the surface area down before full shade placement. This will not only prime the area, but will also help remove any residue from previous window treatments. We do not recommend the shades to be placed on a wallpapered, freshly painted (within 30-90 days), high gloss or textured surfaces. Drywall, bare, varnished or lacquered wood surfaces are also not recommended for shades to be placed on. Our shades are not weather proofed, we do not recommend them for outdoor use. Do you have details on the product warranty? 100% Satisfaction Guarantee- We stand behind our products. We know you’ll find the look you want with our quality fabrics, construction, and exclusive No Tools Installation. We also know sometimes things go wrong. If you aren’t happy with your shades, please let us know – we will run through a brick wall to make things right. How do I measure for and install my shades? We have handy guides for measuring and installation with step-by-step instructions and videos. 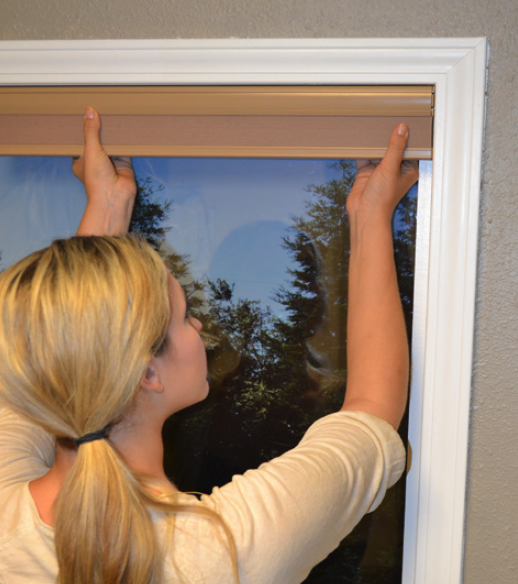 Inside mount means the shade will be installed within the recessed area of your window opening. 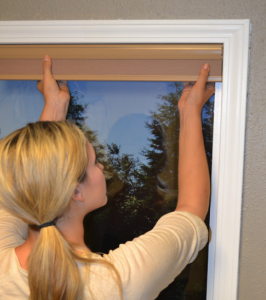 Outside mount means the shades will be installed on the wall surface, outside the window opening, or directly on the trim or molding that surrounds the perimeter of the window opening. You can learn more about both by heading to our measuring guide and our blog post inside vs. outside mount. How do I install the adhesive Simple Stick shades like Original, Original Arch, Easy Lift, Easy Lift Select, and Sheer View as an outside mount? Turn the top pleat or head railing with adhesive, to a 90 degree angle. Place it flat against the surface above the window. The shade will cascade over its self to cover the window. 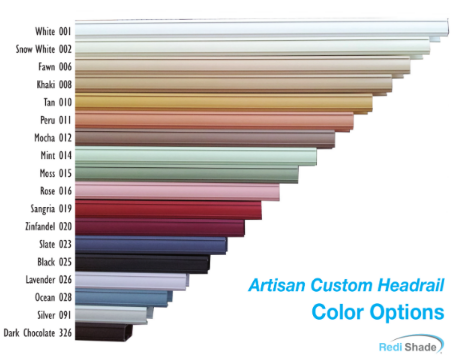 What sizes are available for Artisan Custom Shades? Check out the technical specifications here. What sizes are available for Artisan Select? What sizes are available for Easy Lift Shades? What sizes are available for Easy Lift Select Shades? *No plastic cutting guide or end caps provided. What are differences between Easy Lift and Easy Lift Select shades? What sizes are available for Original Shades? Trim to any size, overlap two or more for wider windows. What sizes are available for Original Arch Shades? What sizes are available for Sheer View Solar Shades? We have handy guides for measuring and installation with step by step instructions, photos and videos. Do you have a craft guide for Original or Original Arch? Yes we do. Check out our craft guide for some great ideas. Does the Original Arch come in other colors? Yes it does! We offer the Arch in pleated white light filtering paper as well as pleated white and natural light filtering, light blocking and sheer view fabrics. You can also easily paint the Arch Shade to give it its own unique look! We recommend checking with your local craft or hardware store for which type of paint is best for the material. Find more tips in the craft guide. Can I purchase just an arch holder? No, these are only sold with the Original Arch shade. Can these shades be installed in the bathroom? The shades can be installed in a well ventilated bathroom, however, we do not recommend installing in a window inside a shower area or enclosure. Can I paint my Original or Original Arch shade? Yes you can. Most paints will adhere to the shades, however, we recommend checking with your local craft or hardware store on which type of paint is best for the material. Yes, being an environmentally friendly company is important to us. Read all about our environmentally friendly products and efforts. What are the most energy efficient shades? Cellular shades are the most energy efficient option. They are often referred to as honeycomb shades because of the way the shade’s cells look from the side. Cellular shades will provide maximum insulation and energy efficiency. Pleated shades are usually made with a single layer of material and have pleats that resemble an accordion. They offer less insulation than cellular shades, but are more affordable. Read all about energy efficiency and selecting the best Redi Shade window shades for energy efficiency in our guide. Do any of the shades have external cords? No. All Redi Shade window shades include cordless operation as a standard feature to ensure they always provide maximum safety, ease of use, and a clean, cord-free appearance. We are proud members of the Window Covering Safety Council and our shades have been nominated as some of the best for homes with children and pets. Artisan Custom, Artisan Select, Easy Lift, and Easy Lift Select raise and lower with the bottom rail. Original and Sheer View shades raise and lower with included clips. Can I get technical specifications for your shades? For product specifications head to our specifications guide. My windows are longer than the available sizes; can I still use the Redi Shade products? – Redi Shade Extra has two extra-long pleated window shades, available in light filtering paper only, measuring 48″ wide by 90″ long (each shade) which fit extra-long windows up to 7 feet long. – Easy Lift and Easy Lift Select shades are available in 64” length. – Artisan Select are available in 72” length. – Artisan Custom shades are custom made so you can select whatever length you need in 1/8” increments, for windows 10”- 82” long. My windows are wider than the available sizes; can I still use the Redi Shade products? – Original and Sheer View shades can easily be overlapped to cover a wider width. Just overlap two or more shades to cover your windows. – Easy Lift and Easy Lift Select shades can be installed side-by-side, to cover larger widths. – Artisan Custom and Artisan Select are custom products so you can measure for the exact width that you need in 1/8” increments, for windows 19”-72”. Head to our measuring guide to learn how to measure your window. We stand behind our products. We know you’ll find the look you want with our quality fabrics, construction, and exclusive No Tools Installation. We also know sometimes things go wrong. If you aren’t happy with your shades, please let us know, by email, customersupport@redishade.com, by phone, (888) 608-6611, or live chat – we will run through a brick wall to make things right. Can you send someone over to measure my windows? We don’t offer home consultations, but our products are all DIY. Check out these handy guides for measuring and installing complete with instructions, photos, and videos. If you are still stuck, let us know by live chatting, giving us a call at (888) 608-6611 or email, customersupport@redishade.com. We’ll be happy to help. Artisan Custom, Artisan Select, Easy Lift and Easy Lift Select raise and lower with the bottom rail. What can I use to cut trim-at-home shades like Orignal, Original Arch, Easy Lift, Easy Lift Select, and Sheer View? For Original, Sheer View and Original Arch shades: use a utility knife to cut the width (while the shade is folded, stacked in it’s pleats) cutting though a few pleats at a time. The length can be trimmed with scissors. You can also use the Original Cutter which cuts through all the pleats at one time. For Easy Lift and Easy Lift Select shades: trim the width on both sides, using a sharp, smooth-edged knife of at least 3.5″. *Easy Lift is provided with a plastic cutting guide. Easy Lift Select is not. – Redi Shade Extra available only in light filtering paper, has two extra-long pleated window shades measuring 48″ wide by 90″ long (each shade) which fit extra-long windows up to 7 feet long. How do I remove my Simple Stick Shade? 1. Gather the shade together so the pleats are condensed at the top rail. 2. Starting at one end, gently begin to pull the shade away from the window frame. The top rail of the shade should begin to separate from the window frame. 3. Continue doing this until the shade has released from the window frame. This action will be the same for both inside and outside mounted Redi Shade products, including Arch shades. What can I do to remove adhesive residue if that should occur? – If residue is sticky, try rolling off the residue using your fingers. – If the first technique does not work, apply rubbing alcohol/hydrogen peroxide to residue and let sit for 10 minutes. Next, with a putty knife or spatula, remove residue gently to avoid damage to your window or frame. – If the first two suggestions do not work, use Goo Gone (found in many hardware stores). Apply Goo Gone directly to residue with soft pad (folded cloth or paper towel). Let soak for 10 minutes. Then, with a putty knife or spatula remove residue. Use a gentle touch to avoid damage to window or frame. Note: Plain white paper towels are recommended, due to the transferring of ink that may occur from using printed towels. How do I know if I have Original Arch Version 1 or Version 2? We’ve updated the way our Original Arch shades are measured to better fit your window. To determine whether you’ve purchased Original Arch Shade Version 1 or Original Arch Shade Version 2, take a look at the patented trimming scale on the side of the arch. Locate area of the trimming guide to the left of the ruler. you are using Original Arch Shade Version 1, follow the instructions for measuring and installing listed here. you are using Original Arch Shade Version 2, follow these instructions for measuring and installing. Why is the measurement scale on the Original Arch shade an inch off? The Original Arch measuring guide is devised to allow for an inch of space, so the shade will fit properly in the window, accommodating the bump in the middle of the arch holder. Head to the measuring and installation guides to learn more. What’s Included with my Artisan Custom or Artisan Select shade order? How do I install/reinstall my Artisan Custom or Artisan Select shade? 1. 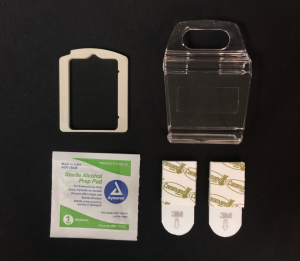 Locate the two additional Command Strips provided in the Parts Bag. 2. 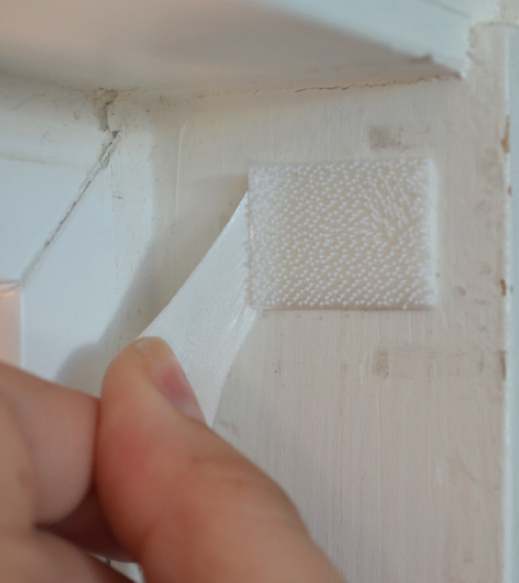 Apply the tab side of the Command strips to the non-tab side of the strips with the tab facing the window side. When do I need to use the Simple Fit Spacer included with my Artisan Shade order? If the red warning line is visible after installation, use the included Spacer to ensure shade is properly installed. Check out the video below for more information. 1. Remove the Fixed End mount from left side of head rail. 2. Place the Spacer over Fixed End mount. 3. Reattach Fixed End mount with the Spacer by inserting into head rail. 4. Press firmly to secure. How do I install the handle(s) included with my Artisan Custom shade? There are two types of handles included with Artisan Custom shades: Standard and Middle Rail handles (pictured below). Check out our video tutorial for the Standard handle for more. Check out our video tutorial for the Middle Rail handle for more. How do I remove my Artisan Custom or Artisan Select shade? 1. Grasp shade with both hands and push firmly toward Trigger End (right side) until Fixed End (left side) disengages. Swing Fixed End clear of window frame, then disengage and swing Trigger End from the window frame. 2. Using the Command Tab, stretch the strip slowly until it releases from the surface. Can Artisan Custom & Artisan Select Shades be used with an Outside Mount? Yes. Simple Fit No Tools Installation is available with Inside Mount only. Outside Mount is available upon request. If you request Outside Mount Installation these special brackets will be included with your order. 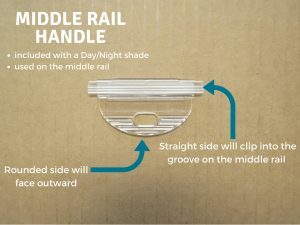 Outside mounted shades do not use the Simple Fit Installation Method. Outside Mount brackets will be required. See Figure A. Extension brackets are available for Outside Mount brackets. These brackets may be needed when the shade needs to operate around an obstruction. See Figure B. If you plan on using Artisan shades for Outside Mount installation we recommend adding 3” to your width and height measurements before ordering the shades. This means (1 1/2” each side), so the shade overlaps the window frame for full light control. Your recorded measurement will be used – no deductions or additions will be made for Outside Mount. Please contact us, 1-888-608-6611, if you have questions about Outside Mount installation. We don’t offer home consultations, but our products are all DIY. Check out these handy guides for measuring and installing complete with instructions, photos, and videos. If you are still stuck let us know! We are available by live chatting, email, customersupport@redishade.com, or by giving us a call at (888) 608-6611. We’ll be happy to help. How do I clean my shades? – Lightly dust or vacuum with upholstery attachment. For spot cleaning lightly blot with mild detergent and warm water. – The shade is not intended for dry cleaning, spot removers, strong detergent or full water immersion. – Lightly dust and/or vacuum with upholstery attachment. – Since they are paper shades any contact with water will ruin the shade. What if my shade becomes unbalanced? If your shade becomes unbalanced and hangs unevenly. Place your hands on the bottom railing spaced an equal distance apart. Gently pull the shade down the full length, or as far as it will go. Help guide the shade back up to the top, keeping the bottom railing as level as possible. This action may have to be done several times until the shade corrects balance. 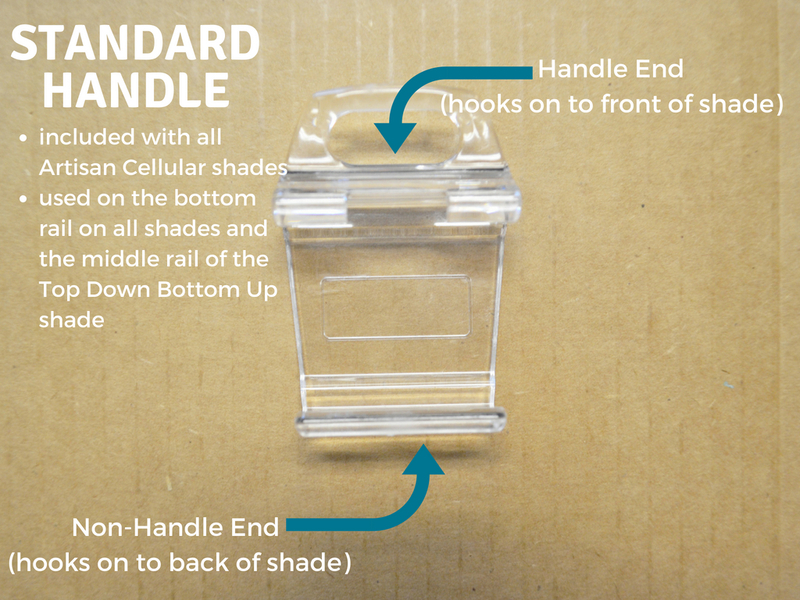 If the shade does not reset, reach out to us, customersupport@redishade.com. – Remove the Fixed End mount from left side of head rail. – Place the Spacer over Fixed End mount. – Reattach Fixed End mount with the Spacer by inserting into head rail. – Press firmly to secure. How do I measure & install for an outside mount? Turn the top pleat or head railing with adhesive, to a 90 degree angle. Place it flat against the surface above the window. The shade will cascade over its self to cover the window. Learn more about installation with our handy installation guide. The Original Arch measuring guide is devised to allow for an inch of space, so the shade will fit properly in the window, accommodating the bump in the middle of the arch holder. Head to the measuring and installation guides to learn more. We stand behind our products. We know you’ll find the look you want with our quality fabrics, construction, and exclusive No Tools Installation. We also know sometimes things go wrong. If you aren’t happy with your shades, please let us know, by email, customersupport@redishade.com, phone (888) 608-6611, or live chat – we will run through a brick wall to make things right. What is the difference between Artisan Custom and Artisan Select? With Artisan Custom shades you can fully design every aspect of your shade from size, functionality, fabric, and light control. We offer these shades in the Standard fashion as well as Top Down/Bottom up and Day/Night options. With Artisan Select shades, they are always in the Standard fashion with a length of 72″. The width is variable in 1/8″ increments starting at 19″-64″. You can design the width, fabric, and light control. You can also visit our blog post on this topic or check out the visual guide below to find which product is right for you. Yes. Simple Fit No Tools Installation is available as an Outside Mount upon request. If you request Outside Mount Installation special brackets will be included with your order. Extension brackets are available for Outside Mount brackets, upon request. These brackets may be needed when the shade needs to operate around an obstruction. See Figure B. Please contact us, (888)-608-6611, if you have questions about Outside Mount installation. How do I install the handle included with my Artisan Select shade? A Standard Handle is included with all Artisan Select shades. Yes. Simple Fit No Tools Installation is available as an Outside Mount, upon request. If you request Outside Mount Installation these special brackets will be included with your order. Extension brackets are available, upon request, for Outside Mount brackets. These brackets may be needed when the shade needs to operate around an obstruction. See Figure B. Please contact us, (888) 608-6611, if you have questions about Outside Mount installation. If your shade becomes unbalanced and hangs unevenly. Place your hands on the bottom railing spaced an equal distance apart. Gently pull the shade down the full length, or as far as it will go. Help guide the shade up to the top, keeping the bottom railing as level as possible. This action may have to be done several times until the shade corrects balance. If the shade does not reset, reach out to us, customersupport@redishade.com. *Provided with plastic cutting guide and end caps. Cellular shades are the most energy efficient option. They are often refereed to as honeycomb shades because of the way the shade’s cells look from the side. Cellular shades will provide maximum insulation and energy efficiency. 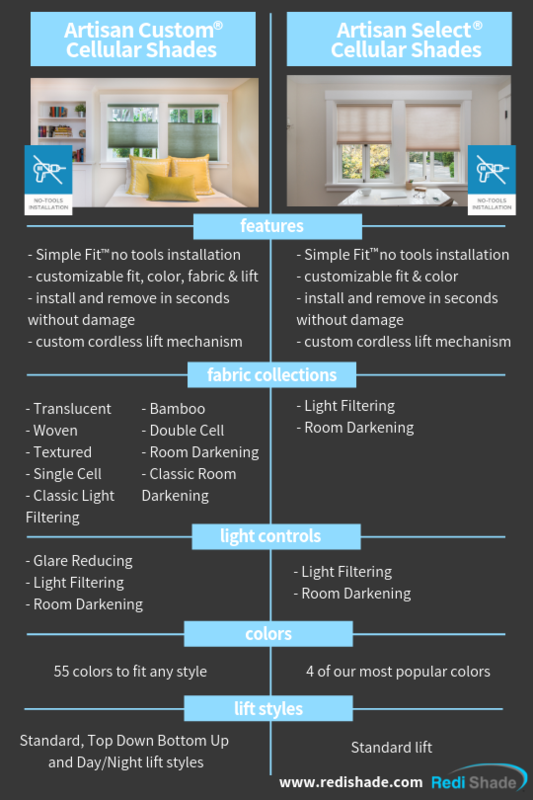 Read all about energy efficiency of our shade styles before selecting the best Redi Shade window shade for your home. – Trim to any size, overlap two or more for wider windows. *Depth required for mounting as an inside mount 1 1/4″. How to raise and lower the Original style shade? To raise the shade and allow light to come in, the shade will need to be repleated by hand. Each shade is supplied with two clips, that are used to clip the shade to itself, at the desired height you would like. The clips can be placed on either the front of the shade or off to the side. 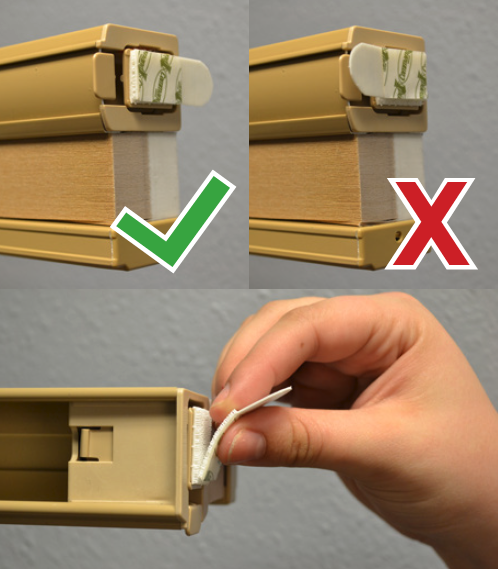 To bring the shade down, gently remove the clips and the shade will fall into place covering the window. Note: Be sure to install the trimmed section of the shade that has red instructional text rather than the excess section without the red instructional text (which can be discarded). This will ensure a proper fit. The Original Arch measuring guide is designed to allow for an inch of space, so the shade will fit properly in the window, accommodating the 1″ semi-circle at the center of the arch holder. How do I measure/install for an imperfect arch window? Original Arch Shades are designed to be installed as an inside mount and are designed to fit perfect arch windows. While you may be able to cut and trim the shade for some imperfect arches, we cannot guarantee they will work for you. The general steps for imperfect arches are listed below. We do not recommend using Original Arch Shades for Eyebrow or Elliptical Windows. If you need an arch shade for these kinds of arches, we recommend looking at a custom arch solution which Redi Shade does not offer. Visit your local home improvement store for assistance with these types of shades. If you choose to use an Original Arch Shade for an imperfect arch we cannot guarantee that it will work and we will not be able to honor the 100% Satisfaction guarantee in this case. Place the Arch Shade in your window, fan open. Take a pencil and trace, on the excess material, following the curvature of the window. Remove the shade and with a sharp pair of scissors, cut off the excess material, following the curve. Replace the shade in the window, and mount down to the sill. Visit check out our imperfect arch guide video for more detailed steps and information. They can be used as a stand-alone solution or layered behind existing window treatments for additional sun control.